I've named my purple 12 x 12 challenge entry 'Cerego' as reference to it being my first piece finished since moving onto our boat. 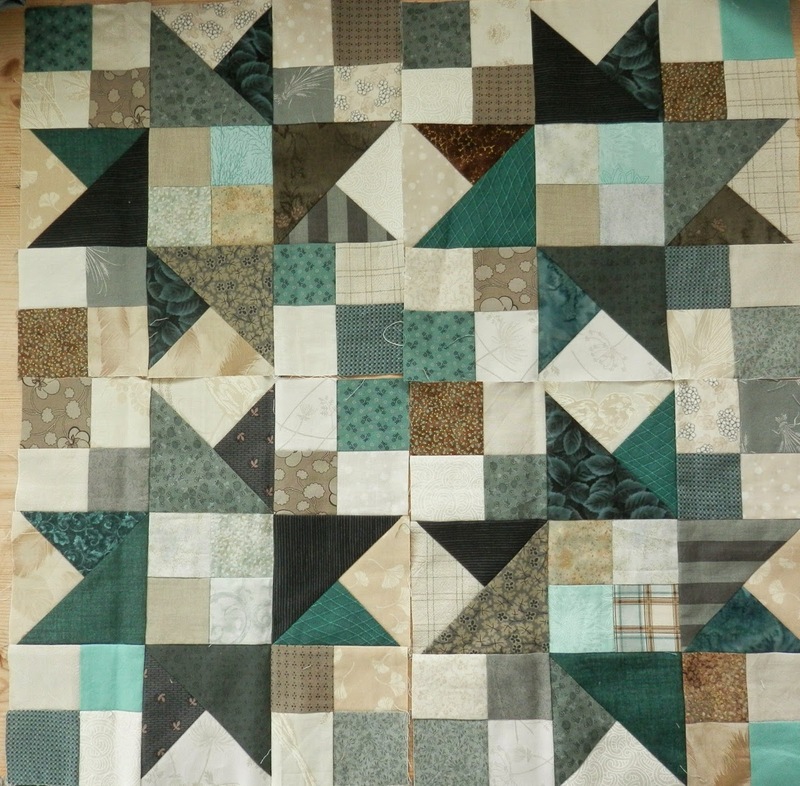 The deadline for these quilts isn't until November 20th, so I think I may start another one. I'm feeling a little down that I won't be entering anything into the Symposium exhibition this time around. It's ok, I consciously decided to give myself absolutely no pressure so I could cope with the moving and settling in process, but it's still a bit of a regret. Stitching and sending off a couple of purple quilts may go some way to soothing my feelings. 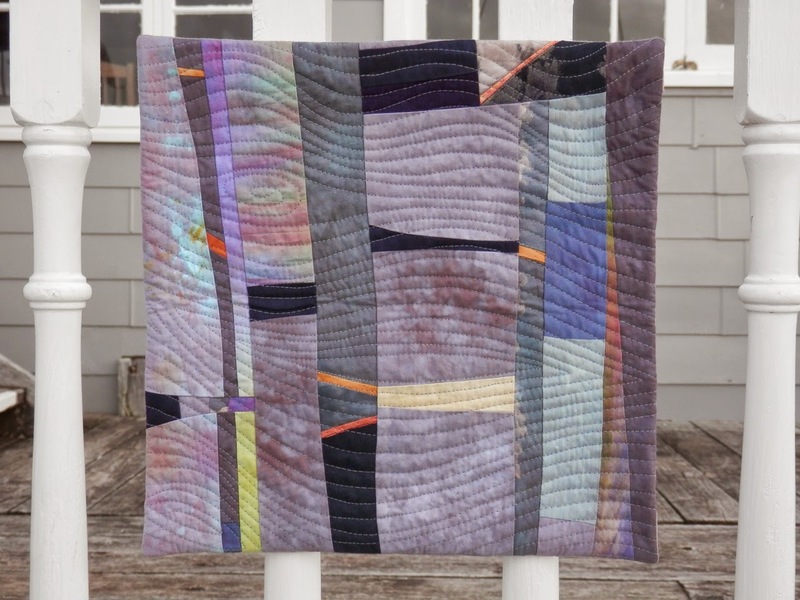 These challenge quilts are not juried, so all are displayed, and they make a fabulous colourful display. 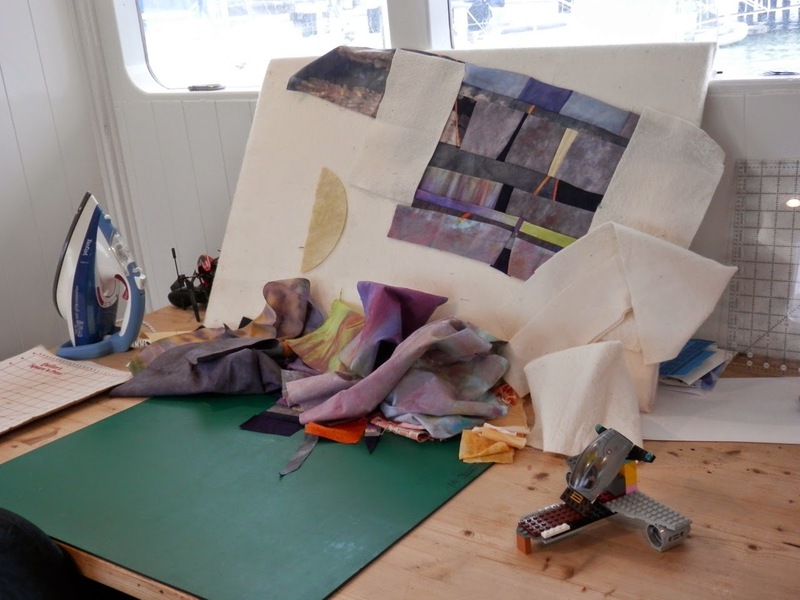 You also don't have to be a member of Aotearoa Quilters to enter (although I'd encourage you to join, I think it's important we support our national guild). And there is a $300 prize sponsored by Quiltmania and several other prizes sponsored by Wrights Fabric. Does that get you interested? Click here for more details. I'd love to see your quilt hanging next to mine! And the title comes with a great big nod to Lee-Ann Newton (read about her quilt 'The Comfort of Stitch' here). And she is so right. The comfort stitching can give, the distraction, the joy and the friendship. I've finally cracked my fabrics and done a bit of sewing, and it feels SO good. Yes, I had been doing a little bit here and there, but most of that was off the boat at friends or work, and it was nothing I had to think about. The sewing that I'm talking about was creative designing and sewing. The emotionally soothing and brain nourishing work that feeds my soul. 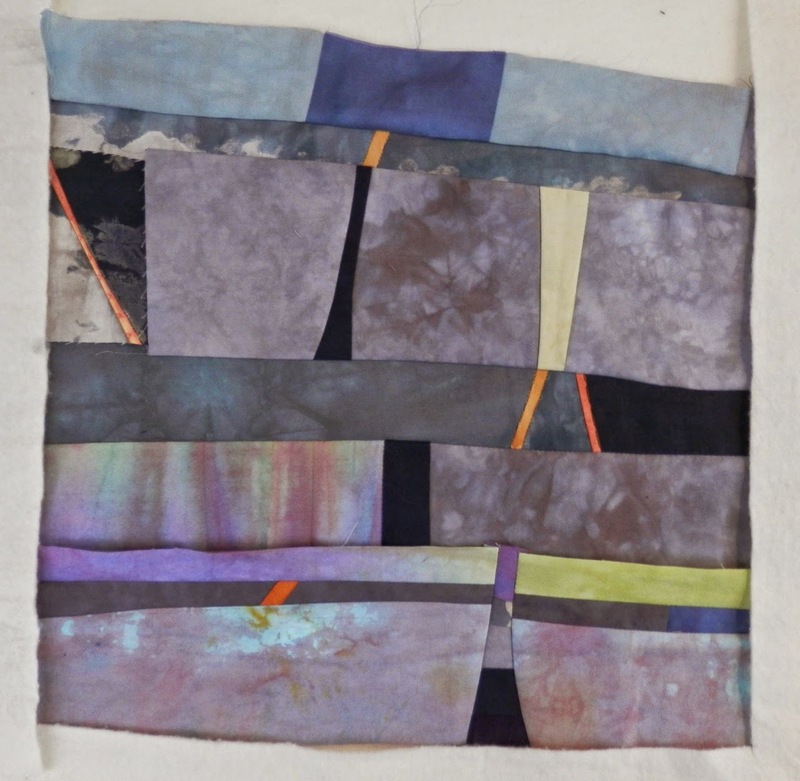 Aotearoa Quilters have issued another 12 x 12 Colour Challenge. This time it is purple (previously they have run red and blue challenges). I opened up my hand dyed fabrics and began to pull purple's. I felt like using the improv skills I learnt with Gwen Marston at the last NZ Symposium, so I just began to cut (without a ruler, gasp!) and piece. I was soon absorbed be the process, the intricacies of inserting little flickers of interest, the auditioning of strips, the thinking about whether the design was working or not. Here's as far as I have got. It's approaching the correct size, although I'll face it, rather than bind it, and I need to remember that more than a quarter of an inch is taken up by that process (ask me how I know). Yep, a mini, portable design wall, cutting mat and ironing pad on the dining table, fighting for space with the lego and toy helicopter. But these compromises go hand in hand with the benefits of the life we've chosen to live. Like the sunrise while I walk the dog. 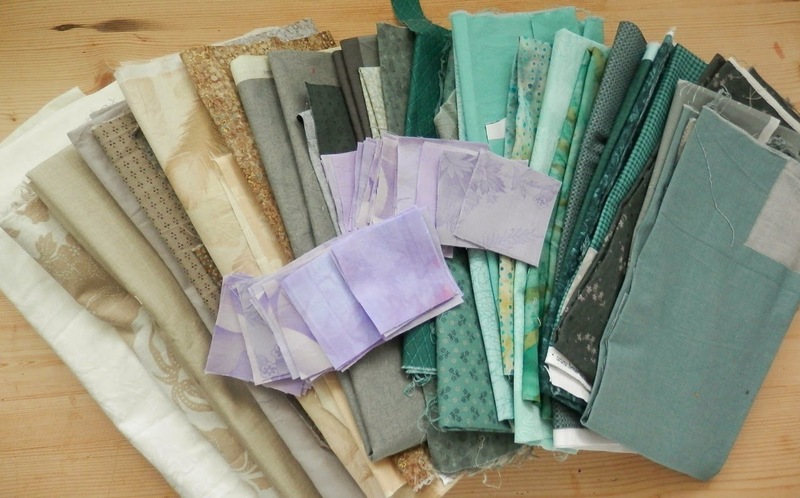 Hmm, I just noticed that there are plenty of similar colours in my quiltlet and this photo - the benefits of working in a intuitive way? 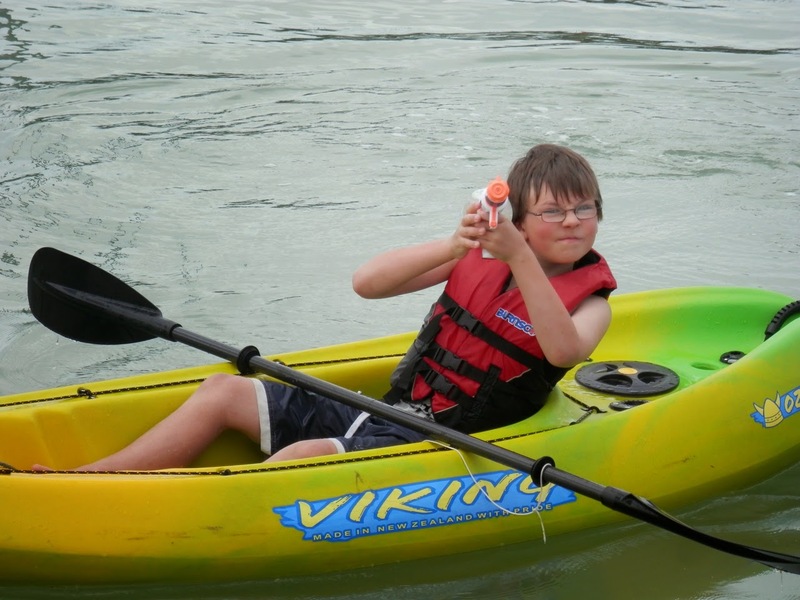 And my son being able to jump in his new birthday present any time he likes and go for a paddle. Thanks to Shelly who left me a wonderful comment about how she spent her first years of childhood on a boat and wouldn't have changed it for the world. Thank you so much to everyone who has left me supportive comments or sent me lovely emails. I really appreciate it and they all make me smile. We're getting there! 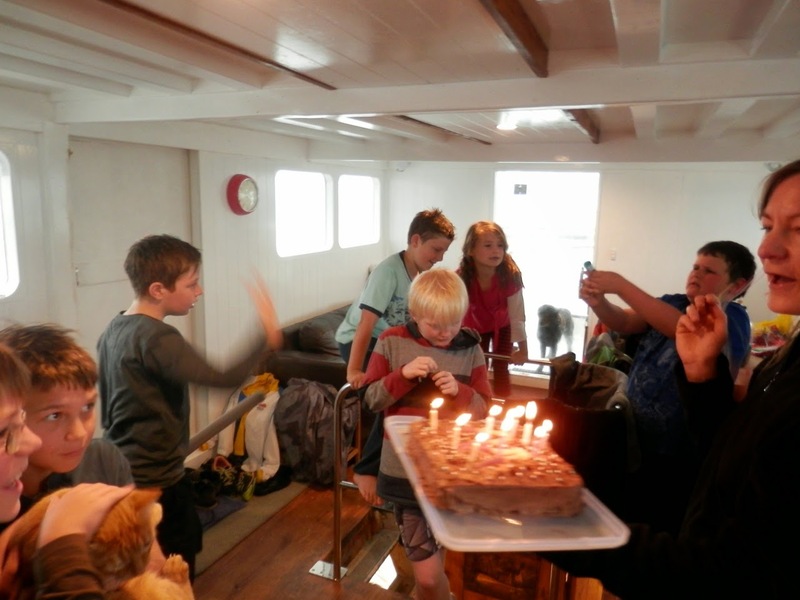 I'll leave you with this photo of my son's tenth birthday party. I think it sums up the slightly chaotic but wonderful party that was had on a rainy day in a boat! 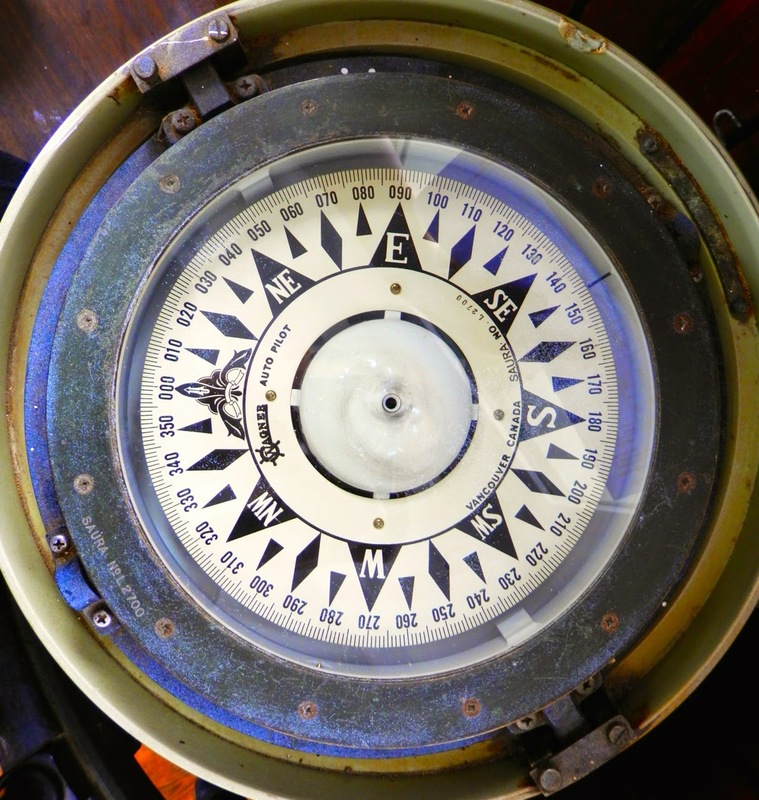 This is MV Cerego's compass. It's a cool old thing, set on gimbals (swivelly, ball thingies that make it level no matter how the boat is sitting) and I love it. I also thought it was an appropriate symbol of how I'm feeling at the moment. 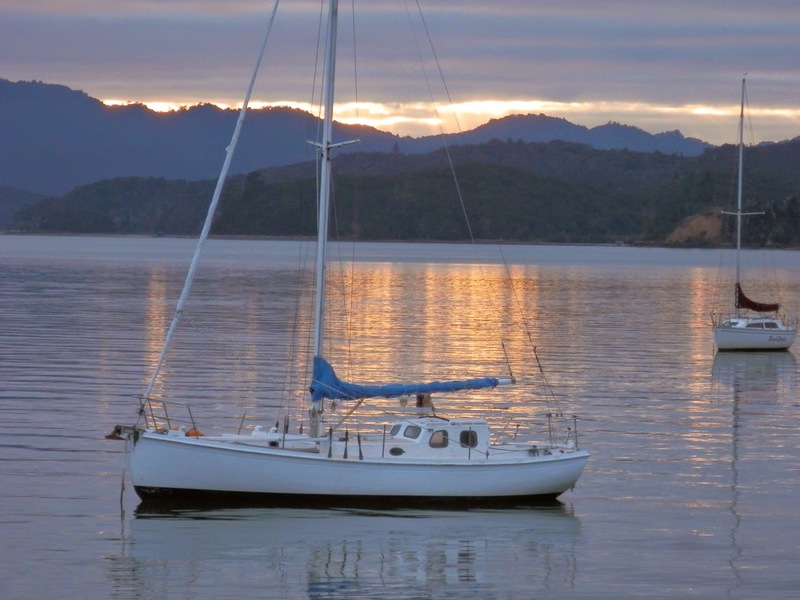 We are living on the boat - we've been here for about five weeks or so, but I'm still not settled. We finally have a boat builder working in our forward cabin, building our bed and storage units, but in the meantime Hubby and I have been sleeping on the couches in the kid's playroom. I'm getting over that very quickly. Because we are missing the room and storage that our cabin will give us, I haven't been able to sort a sewing area out properly. And I've been so busy moving, sorting, organising tenants etc, etc that I haven't had much time to quilt anyway. I let all obligations and deadlines go so that they wouldn't stress me out. But on the downside of that is now I feel a bit 'drifty' or focusless. And what do you write on a blog, or say in a podcast, when you have been doing very little and your thoughts are all awry? It didn't help that I had no WiFi - at least that's mostly sorted now. So I'm starting with baby steps. Like writing this today. A small blog post, with no real planning behind it, just to re acquaint my fingers with the keyboard.